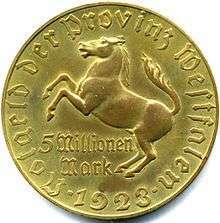 Exceptions to the rule of face value being higher than content value also occur for some bullion coins made of copper, silver, or gold (and, rarely, other metals, such as platinum or palladium), intended for collectors or investors in precious metals. Examples of modern gold collector/investor coins include the British sovereign minted by the United Kingdom, the American Gold Eagle minted by the United States, the Canadian Gold Maple Leaf minted by Canada, and the Krugerrand, minted by South Africa. While the Eagle, Maple Leaf, and Sovereign coins have nominal (purely symbolic) face values; the Krugerrand does not. The first coins were developed independently in Iron Age Anatolia and Archaic Greece, India and China around the 7th and 6th centuries BCE. 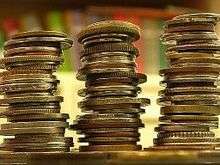 Coins spread rapidly in the 6th and 5th centuries BCE, throughout Greece and Persia, and further to the Balkans. Standardized Roman currency was used throughout the Roman Empire. Important Roman gold and silver coins were continued into the Middle Ages (see Gold dinar, Solidus, Aureus, Denarius). Ancient and early medieval coins in theory had the value of their metal content, although there have been many instances throughout history of the metal content of coins being debased, so that the inferior coins were worth less in metal than their face value. Fiat money first arose in medieval China, with the jiaozi paper money. 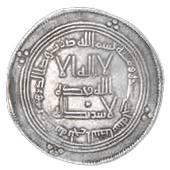 Early paper money was introduced in Europe in the later Middle Ages, but some coins continued to have the value of the gold or silver they contained throughout the Early Modern period. 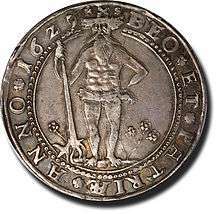 The penny was minted as a silver coin until the 17th century. The first circulating United States coins were cents (pennies), produced in 1793, and made entirely from copper. Silver content was reduced in many coins in the 19th century (use of billon), and the first coins made entirely of base metal (e.g. nickel, cupronickel, aluminium bronze), representing values higher than the value of their metal, were minted in the mid 19th century. Greek drachma of Aegina. Obverse: Land Chelone / Reverse: ΑΙΓ(INA) and dolphin. The oldest Aegina Chelone coins depicted sea turtles and were minted c. 700 BCE. The earliest coins are mostly associated with Iron Age Anatolia, especially with the kingdom of Lydia. Early electrum coins were not standardized in weight, and in their earliest stage may have been ritual objects, such as badges or medals, issued by priests. Many early Lydian and Greek coins were minted under the authority of private individuals and are thus more akin to tokens or badges than to modern coins, though due to their numbers it is evident that some were official state issues, with King Alyattes of Lydia being a frequently mentioned originator of coinage. The first Lydian coins were made of electrum, a naturally occurring alloy of silver and gold that was further alloyed with added silver and copper. 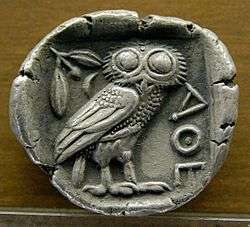 Most of the early Lydian coins include no writing ("legend" or "inscription"), only an image of a symbolic animal. 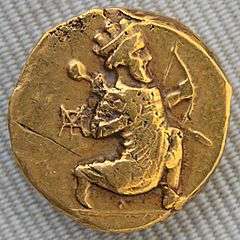 Therefore, the dating of these coins relies primarily on archaeological evidence, with the most commonly cited evidence coming from excavations at the Temple of Artemis at Ephesus, also called the Ephesian Artemision (which would later evolve into one of the Seven Wonders of the Ancient World). Because the oldest lion head "coins" were discovered in that temple, and they do not appear to have been used in commerce, these objects may not have been coins but badges or medals issued by the priests of that temple. Anatolian Artemis was the Πὀτνια Θηρῶν (Potnia Thêrôn, "Mistress of Animals"), whose symbol was the stag. Alternatively, Phanes may have been the Halicarnassian mercenary of Amasis mentioned by Herodotus, who escaped to the court of Cambyses, and became his guide in the invasion of Egypt in 527 or 525 BCE. According to Herodotus, this Phanes was buried alive by a sandstorm, together with 50,000 Persian soldiers, while trying to conquer the temple of Amun–Zeus in Egypt. The fact that the Greek word "Phanes" also means light (or lamp), and the word "sema" also means tomb makes this coin a famous and controversial one. 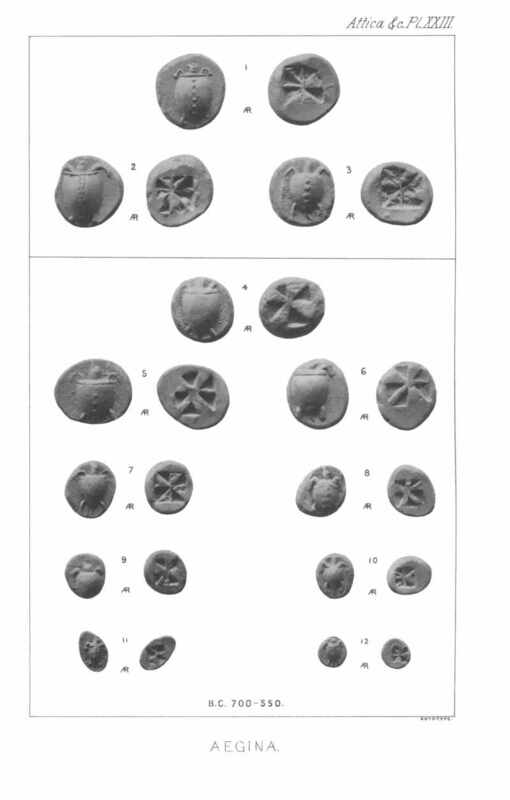 Another candidate for the site of the earliest coins is Aegina, where Chelone ("turtle") coins were first minted on 700 BCE, either by the local Aegina people or by Pheidon king of Argos (who first set the standards of weights and measures). 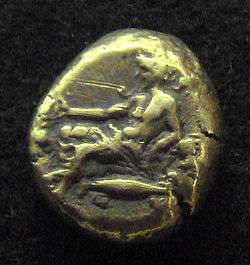 In the Bibliothèque Nationale, Paris, there is a unique electrum stater of Aegina. Coins from Athens and Corinth appeared shortly thereafter, known to exist at least since the late 6th century BCE. Coinage followed Greek colonization and influence first around the Mediterranean and soon after to North Africa (including Egypt), Syria, Persia, and the Balkans. Coins were minted in the Achaemenid Empire, including the gold darics and silver sigloi. With the Achemenid conquest of Gandhara under Darius the Great c. 520 BCE, the practice spread to the Indo-Gangetic Plain. The coins of this period were called Puranas, Karshapanas or Pana. 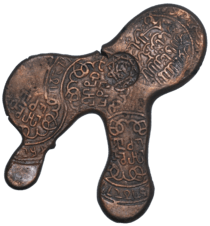 These earliest Indian coins, however, are unlike those circulated in Persia, which were derived from the Greek/Anatolian type; they not disk-shaped but rather stamped bars of metal, suggesting that the innovation of stamped currency was added to a pre-existing form of token currency which had already been present in the Mahajanapada kingdoms of the Indian Iron Age. Mahajanapadas that minted their own coins included Gandhara, Kuntala, Kuru, Panchala, Shakya, Surasena and Surashtra. 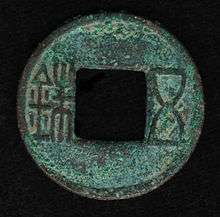 In China, early round coins appeared in the 4th century BCE. 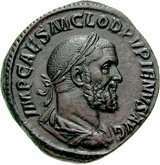 The first Roman coins, which were crude, heavy cast bronzes, were issued c. 289 BCE. Bronze coin issued by Antiochus IV Epiphanes, 2nd century BCE. Coin edges are curled to prevent swindlers from stealing metal by scraping the edges. This has been a particular problem with nickels and dimes (and with some comparable coins in other currencies) because of their relatively low face value and unstable commodity prices. 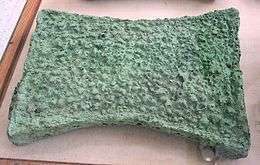 For a while the copper in US pennies was worth more than one cent, so people would hoard pennies and then melt them down for their metal value. 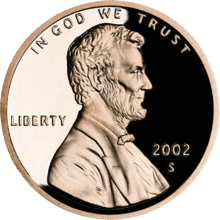 It cost more than face value to manufacture pennies or nickels, so any widespread loss of the coins in circulation could be expensive for the US Treasury. This was more of a problem when coins were still made of precious metals like silver and gold, so strict laws against alteration make more sense historically. The side of a coin carrying an image of a monarch or other authority, or a national emblem, is usually called the obverse, or colloquially, heads; see also List of people on coins. The other side, which may carry the denomination, is usually called the reverse, or colloquially, tails. The year of minting is usually shown on the obverse, although some Chinese coins, most Canadian coins, the pre-2008 British 20p coin, and all Japanese coins, are exceptions. In cases where a correctly oriented coin is flipped about its horizontal axis to show the other side correctly oriented, the coin is said to have coin orientation. In cases where a coin is flipped about its vertical axis to show the other side correctly oriented, it is said to have medallic orientation. While coins of the United States dollar display coin orientation, those of the Euro and pound sterling have medallic orientation. 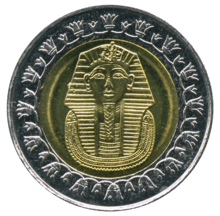 Bimetallic coins are sometimes used for higher values and for commemorative purposes. 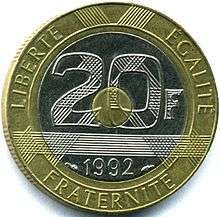 In the 1990s, France used a tri-metallic coin. Common circulating bimetallic examples include the €1, €2, British £2 and Canadian $2 and several Peso coins in Mexico. 3 Russian Rubles coin minted in 2008. Not all coins are round. The Australian 50 cent coin, for example, has twelve flat sides. Some coins have wavy edges, e.g. the $2 and 20-cent coins of Hong Kong and the 10 cent coins of Bahamas. 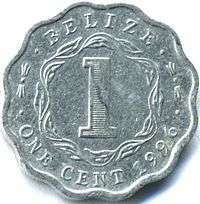 Some are square-shaped, such as the 15 cent coin of the Bahamas. During the 1970s, Swazi coins were minted in several shapes, including squares, polygons, and wavy edged circles with 8 and 12 waves. 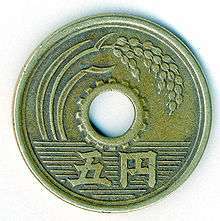 Many coins over the years have been manufactured with integrated holes such as Chinese "cash" coins, Japanese coins, Colonial French coins, etc. This may have been done to permit their being strung on cords, to facilitate storage and being carried, etc. The Royal Canadian Mint has also released several coins that are coloured, the first of which was in commemoration of Remembrance Day. The subject was a coloured poppy on the reverse of a 25 cent piece. Coins are popularly used as a sort of two-sided dice; in order to choose between two options with a random possibility, one choice will be labeled heads and the other tails, and a coin will be flipped or tossed to see whether the heads or tails side comes up on top – see coin flipping. Mathematically, this is known as a Bernoulli trial: a fair coin is defined to have the probability of heads (in the parlance of Bernoulli trials, a "success") of exactly 0.5. Iron and copper coins have a characteristic metallic smell that is produced upon contact with oils in the skin. Perspiration is chemically reduced upon contact with these metals, which causes the skin oils to decompose, forming with iron the volatile molecule 1-octen-2-one. ↑ Tony Clayton. "Comprehensive list of metals and their alloys which have been used at various times, in coins for all types of purposes". Tclayton.demon.co.uk. Retrieved 2012-05-21. ↑ "Cent". Retrieved 7 March 2015. ↑ "Timeline of the United States Mint". US Mint website. US Department of the Treasury. Retrieved 14 October 2016. 1793 - The first coins struck are 'half dimes', believed to be made from silverware provided by George and Martha Washington. The first circulating coins are copper cents. ↑ "中國最早金屬鑄幣 商代晚期鑄造銅貝-河南概況". Big5.henan.gov.cn. Retrieved 2012-05-22. ↑ Giedroyc, Richard (2006-11-15). The Everything Coin Collecting Book: All You Need to Start Your Collection ... Books.google.com. Retrieved 2012-05-21. ↑ YK Kwan. "A snap shot view of The history of China by YK Kwan". Chinesechinese.net. Archived from the original on 2012-05-03. Retrieved 2012-05-21. ↑ M. Kroll, review of G. Le Rider's La naissance de la monnaie, Schweizerische Numismatische Rundschau 80 (2001), p. 526. D. Sear, Greek Coins and Their Values Vol. 2, Seaby, London, 1979, p. 317. ↑ "The Types of Greek Coins" An Archaeological Essay by Percy Gardner 1883 p.42 "Considering these and other facts it may be held to be probable, if not absolutely proved, that priests first issued stamped coin, and that the first mints were in Greek temples." ↑ G. Hanfmann, pp. 73, 77. R. Seaford, p. 128, points out, "The nearly total lack of … coins in the excavated commercial-industrial areas of Sardis suggests that they were concentrated in the hands of the king and possibly wealthy merchants." ↑ A. Ramage, "Golden Sardis", King Croesus' Gold: Excavations at Sardis and the History of Gold Refining, edited by A. Ramage and P. Craddock, Harvard University Press, Cambridge, 2000, p. 18. ↑ "A Case for the World's Oldest Coin: Lydian Lion". Rg.ancients.info. 2003-10-02. Retrieved 2013-10-23. ↑ "Inscriptions and Titles on ancient Greek coins". Snible.org. Retrieved 2012-05-21. 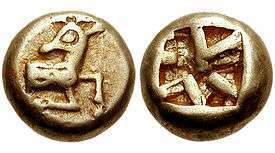 ↑ "Electrum stater inscribed with the name of Phanes". British Museum. 2011-09-29. Retrieved 2012-05-21. ↑ "Full text of "The numismatic chronicle and journal of the Royal Numismatic Society"". Archive.org. Retrieved 2012-05-21. . Herodotus third book (ch. iv.). ↑ "Ancient coinage of Ionia". Snible.org. Retrieved 2012-05-21. ↑ British Museum Catalogue 11 - Attica Megaris Aegina, 700 - 550 BCE, plate XXIII. ↑ "Ancient coinage of Aegina". Snible.org. Retrieved 2012-05-21. ↑ C. Kraay, Archaic and Classical Greek Coins, University of California Press, Berkeley, 1976. ↑ Howgego, C. J. (1995). Ancient history from coins. Psychology Press. pp. 1–4. ISBN 978-0-415-08993-7. Retrieved 4 December 2011. ↑ See P.L. Gupta: Coins, New Delhi, National Book Trust, 1996, Chapter II. ↑ "The COININDIA Coin Galleries: Gandhara Janapada". Coinindia.com. Retrieved 2012-05-22. "The COININDIA Coin Galleries: Kuntala Janapada". Coinindia.com. Retrieved 2012-05-22. "The COININDIA Coin Galleries: Kuru Janapada". Coinindia.com. Retrieved 2012-05-22. "The COININDIA Coin Galleries: Panchala Janapada". Coinindia.com. Retrieved 2012-05-22. "The COININDIA Coin Galleries: Shakya Janapada". Coinindia.com. Retrieved 2012-05-22. "The COININDIA Coin Galleries: Shurasena Janapada". Coinindia.com. Retrieved 2012-05-22. "The COININDIA Coin Galleries: Surashtra Janapada". Coinindia.com. Retrieved 2012-05-22. ↑ "The Janapada Coins". Retrieved 2013-08-10. ↑ Early Dated Coins, http://www.medievalcoinage.com/earlydated, Accessed December 2009. 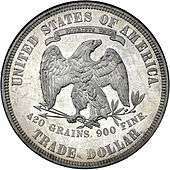 ↑ "United States Mint Moves to Limit Exportation & Melting of Coins". The United States Mint. Retrieved 2012-05-22. ↑ "Convict tokens, National Museum of Australia". Nma.gov.au. 2012-01-25. ↑ Cooper, George (2008). The Origin of Financial Crises. New York: Random House. p. 46. ISBN 978-0-307-47345-5. ↑ "most expensive currencies of the world". 2007-09-12. Archived from the original on 28 April 2012. Retrieved 2012-05-22. ↑ Tony Clayton. "Metals Used in Coins and Medals". Tclayton.demon.co.uk. Retrieved 2012-05-22. ↑ Easwar, K.; Rouyer, F.; Menon, N. (2002). "Speeding to a stop: The finite-time singularity of a spinning disk". Physical Review E. 66 (4). Bibcode:2002PhRvE..66d5102E. doi:10.1103/PhysRevE.66.045102.